Win A Ciaté Nail Bar Worth £50! Love dabbling in a little nail art? Need some more tools for the job? Look no further. 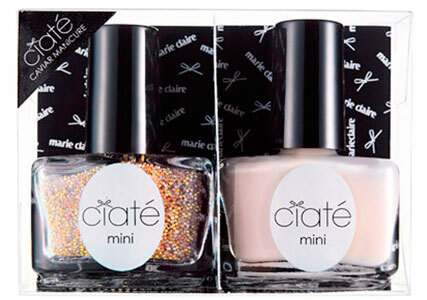 You may have heard by now that we’ve teamed up with Ciaté to offer you an exclusive caviar manicure set worth £10, free when you buy the July issue of Marie Claire. Well, to celebrate, we’re offering five lucky readers their very own caviar nail bar worth £50, to create more caviar looks at home with hundreds of different coloured beads. To enter, just pick up the July issue of Marie Claire to get your free Cookies & Cream and Shooting Star exclusive cover set, then tweet or instagram us at @marieclaireuk with your manicure picture, using the hashtags #marieclaire #ciate – or email your picture to marieclaire@ipcmedia.com. We’ll post the best ones to an album on our Facebook page – so get liking your favourites! Watch the tutorial video below for a step-by-step guide on how to perfect your caviar mani. Terms & conditions: Closing date for entries is 30 June. We will pick five winners – our own ‘Shooting Stars’ – and each winner will receive one Ciaté caviar nail bar.